1. Is the only insect that humans raise for food and medicine. 2. Is responsible for pollinating 70 of the 100 crops that provide 90% of the world's food. 3. Make only 1/12th of a teaspoon of honey in its lifetime. To make a pound of honey, honeybees need to visit 2,000,000 flowers. Each cell of a capped honeycomb contains the nectar from about 1,000 flowers. 4. One ounce of honey would power a bee for a flight completely around the earth. 5. Has hair on its eyes to help keep its eyeballs clean. The hair catches dirt and pollen. 6. Has an incredibly acute sense of smell that has been harnessed by scientists to detect and track down illegal drugs and explosives hidden by terrorists. 7. Is able to regulate the temperature of their hive. In cold weather, the bees huddle together and vibrate their wing muscles to generate heat. When it's hot, they fan their wings to improve air circulation or even collect water for evaporative cooling. 8. Makes about 200 beats per second with their wings, creating their infamous buzzing sound. 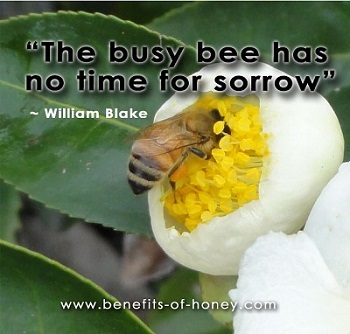 A worker bee in the summer lasts six to eight weeks. Wearing their wings out is the most common cause of their death. 9. Is capable of complex visual processing and learning tasks that are commonly reserved for primates. It is able to remember and discriminate one human face from another, a capacity likely used for foraging, navigation and identifying flowers. 10. Waggle dances and creates airborne sounds to communicate the locations of nectar. 11. Has a highly sophisticated communication system and a phenomenal collective intelligence that has been studied and applied to many organisations trying to learn effective management and leadership styles. 12. Has a grass-seed sized brain that is able to calculate foraging distances and energy expenditure, and find out the shortest route to the targeted flowers, a complex mathematical problem that can keep computers busy for days. Written by Jürgen Tautz, this book, The Buzz about Bees contains an astounding 250 photos that offer great insights about the bees. A captivating book highly recommended book for those are interested in the honeybees and nature. You will appreciate many times more the stunning beauty of the honeybees, their amazing contribution to mankind and every drop of honey you eat. End of "Fascinating Honeybee Facts". Back to "The Awesome Honeybee Dance"